We arrived at the KOA Denver West in the mid-afternoon, with only four days' stay available to us. After that, according to the desk clerk, we must move elsewhere. We've never seen RV parks so crowded as on this trip, and our stay in the Denver area is complicated because there are so few RV parks available and so few of those that are not full. Forget about the state parks; they've been sold out for months. 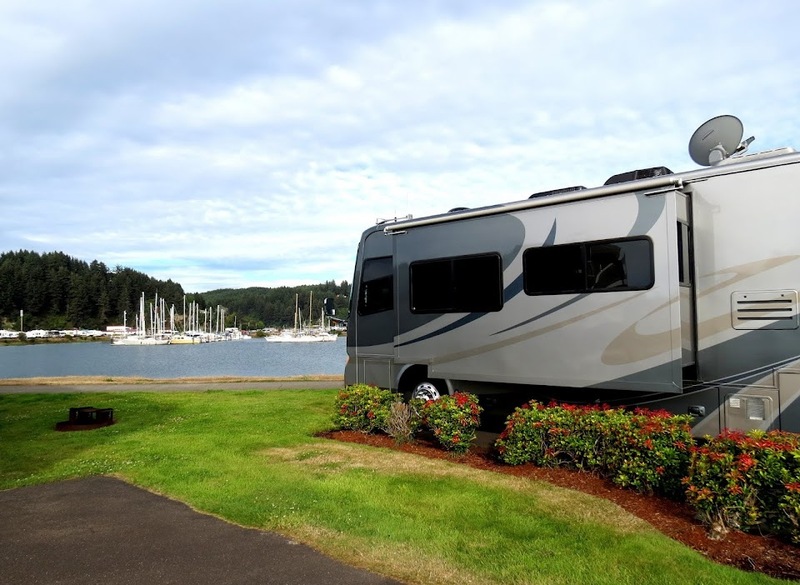 It's sort of a perfect storm, in that RVing is more popular than ever, fuel prices are low and the RV manufacturers are turning out thousands of new units every month that are snapped up by the public. We took a short tour of four of the RV parks nearest Denver, and in only one of those, Dakota Ridge, would we feel comfortable. We're not really that prudish, but a couple of the ones we saw today were nothing but dumps. The Dallas/Fort Worth area has a similar lack of decent RV parks, and there are very few new ones being built anywhere. Somebody is going to recognize the need one day and will do well satisfying it. I know it's cruel to keep reminding my heat-soaked friends in Texas about our temperate summer climate up here, and it is mildly troubling that I keep doing it anyway. So far, though, it doesn't keep me awake at night. Having an appreciation for oddities, curiosities and things I don't see every day, I thought this bag of potato chips looked funny. We bought the package in Denver (5,200 feet elevation) and carried it back up the mountain with us (9,000 feet). The bag looked normal when we were in the store; now, it looks like it has put on a little weight, to which I can certainly relate. If my grandsons were here, we would have a perfect little object lesson on atmospheric pressure changes with altitude. 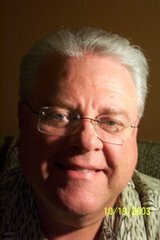 Now, about the comments thing I mentioned in the title of this post: I read friend Craig MacKenna's post of July 28, in which he identified several blogs upon which he couldn't write comments. One of those blogs is this one, and that got me to delve into Blogger to see what the problem could be. I also looked online and found that Blogger's problem with its disappearing comments feature has been going on for years. After looking at the recommended fixes and trying them, nothing seemed to work. Then I disabled the "Use Google+ comments" selection and Voila! The comments feature reappeared. Now I'm not sure what the ramifications of this may be but, whatever they are, having the comments feature working on my blog is essential, in my view. I enjoy reading and responding to them, as it helps establish a relationship with readers, even if it's virtual. A comment, no matter how brief, adds a personal element to the discourse that lifts the impersonal words on a blog page to the level of a conversation between friends, and I like that. Because of Blogger's problems capturing comments, I have toyed with the idea of changing to another blogging platform. However, I really like most of Blogger's features, especially its handling of photos. So, I'm hoping this change will put the comments problem to bed for good. We'll see. You may have noticed that we haven't given any shout outs to restaurants we've visited recently. That's because we haven't found one in quite a while that I would feel good about recommending. Our memories of the good times in Durango with our family are still fresh, and they are a reminder that our fulltiming gig has had no adverse effect on our family relationships. Neither has it affected our relationships with our friends, evidenced by the fun we had at Priest Gulch with Bubba, LouAnn and BreAnn. We plan to drop in on other RV friends while in Colorado, and when we travel back to Texas in the fall, we'll be seeing our friends and relatives there, too. Plus, we have met quite a number of blogging friends in our ten years of RVing. Some of them have become close friends, and we value each and every one. We almost met fellow bloggers Steve and Debbie McCormack here in Buena Vista, but we missed them by a day. I know we'll cross paths again. I have heard so many folks say how it would be impossible for them to go fulltiming because it would uproot them from friends and family. We haven't found that to be so, especially given the way the world has shrunk, thanks to the Internet. We keep up through phone calls, blogs and social media, and we don't feel that we've missed a beat with our relationships. The one area that we do miss, however, is our home church attendance. We have the good fortune to attend our church virtually via video broadcast, and we attend local churches when we can. And whenever we are needing a "grandsons fix", there's no problem--we just jump in Phannie and set a course for Sunset Shores in Willis, Texas--our park of record while we're there. Except they won't be expecting us to show up in the summertime; it's way too hot and humid there on the Gulf coast. So, for those who are wondering, we're still not seeing any downside to this lifestyle. The feeling of freedom trumps everything else. Of course, everything has its season, doesn't it? Sandy and I have gone through most of our seasons by now--newly married, house owning, having a family, working hard to accumulate stuff, empty nesting and then retiring. Now, it's the season to do whatever the heck we want, and roaming the country in a motorhome with few cares or obligations ain't bad. This season will come to an end, of course, but we're not going to worry about that. Then will come the start of the final season, and we're just going to leave that in God's hands. Worrying is bad for you. Overlooking Leadville--highest city in the U. S. at 10,120 feet. By the way, the photo of Leadville above is an original, not something I pulled off the web. But there was a problem with my vantage point when I was shooting it: There were probably a dozen power lines and two towers that spanned the entire view, totally ruining the effect. A quick edit with Movavi and, presto! They were gone. I've told you about this program before but, if you still don't have it and you want your photos to be the best they can be, you should be ashamed. We're off to Denver tomorrow, so stick around. After several fine days camped at Priest Gulch, we drove back to Durango to meet Tyler and Mindy and the grandsons at the airport. Flying in from Houston, all of them were looking forward to the ride from Durango to Silverton on the old steam train. The grandsons, Mason and Pryce, are heavily into trains, and I think they may possess everything imaginable related to Thomas the Train. The next day, we boarded the train shortly after 9:00 a.m. for a 9:30 departure, having booked a gondola car this time instead of a passenger coach, for the sake of better photo opportunities. It did afford a much better platform for photographers, but the smoke and cinders from the engine proved to be a bit unpleasant. However, since the whole purpose of the trip was to enjoy the scenery, the gondola was the far better choice, in my opinion, irrespective of the smoke. Mindy, Pryce, Tyler and Mason shortly after departure from Durango. We pulled into Silverton after about 4 1/2 hours and had lunch at the Brown Bear Cafe (pretty good). Meeting another train ready for departure from Silverton to Durango. Silverton is a wonderfully historic old mining town that bears more investigation. We were a bit pressed for time, so that will have to wait for another trip. It's a very busy time of year for tourism, of course, and the RV park just west of town looked completely full. Since we were so close to Mesa Verde National Park, we decided to make a side trip there, knowing little about it other than its preservation of cliff dwellings used by an ancient culture for some 1,200 years, beginning about the time of Christ. The visitor center is very nice, appearing to have been of fairly recent construction. The rangers were very friendly and informative, and it was a good place to get an overview of the park. We learned that the cliff dwelling sites were near the end of a 20-mile drive across Mesa Verde. Well, it was not actually a mesa but a "cuesta," a term new to me. The difference? A mesa has a flat top, and a cuesta's top is sloped. We pointed Mae toward the park's entrance booths, entering for free with our old people's national park pass. I must say, the twenty miles to the sites is a drive I would gladly have taken even if no attraction awaited at the end. I love the vast vistas of the Southwest anyway, and these were on full display during this drive. There were ample turnouts at particularly good viewing locations. One has to marvel at the talents of the ancient builders who were able to construct, with the most primitive of tools, structures such as these that would survive for 2,000 years and counting. I was also impressed by the wisdom of the builders to relocate their families to a place that would give such significant relief from harsh winters. We didn't think we had missed all that much by eschewing the up-close tours. My imagination is just as fertile from the vantage point of the overview site as it would be up-close and personal to the pueblos. Plus, there was wisdom, I think, in not putting a klutz like me in harm's way, crawling around on rocks and ladders and such. After our excellent visit to Mesa Verde, we returned to have some chili dogs cooked outside on the Weber Q. I had made the chili earlier by cooking it in an iron skillet on top of the Weber Q, a trick I learned from fellow blogger and ex-chef George Yates, whose interesting blog I read. Is Mesa Verde a must see? I think so, especially if you have an interest in the remarkable achievements of these ancient peoples. But you won't be disappointed, even if you choose not to get out of the car. The next post will be from Durango again. It was a little less than a hundred miles from our spot near Durango to Priest Gulch Campground near Dolores, Colorado. The drive here was beautiful, the last 30 miles or so being along the highway 145 portion of the San Juan Skyway, a scenic loop that includes Cortez, Telluride, Ouray, Silverton and Durango. Priest Gulch is a medium-sized RV park with spaces and cabins along both sides of the Dolores River. There are mountains all around, and the small river valley park is certainly among the most scenic I've ever seen. Our RV site backs up to the crystal clear stream, and it's very peaceful to sit on the riverbank and listen to the sound of the water spilling over the rocks in the riverbed. The park is situated on both sides of the river, and coaches must cross this bridge to get to the other side. 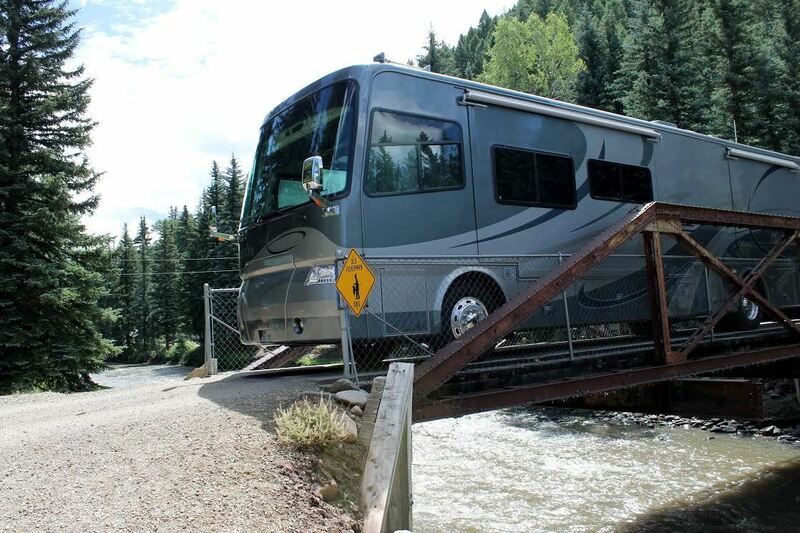 Here's a photo of Phannie crossing the bridge over the Dolores River. Bubba and his family pulled into the park a bit later after a 900-mile drive from Fort Worth. Parking side-by-side, we had our own grassy area to sit and visit while we enjoyed the cool mountain air. We fixed a fajita dinner for Bubba and his bunch, knowing they would be tired on arrival and not in the mood to prepare anything. After a day of resting up from our respective journeys, we decided to go to nearby Telluride and check it out, as neither Sandy nor I had been there before. We woke up on this morning and noticed 49 degrees on the outside air temperature. This must have something to do with the chill in the coach, I thought, still being unaccustomed to summer in the San Juan mountains. I turned around and flipped on the heater, not fully appreciating how absurd such a low temperature must seem to someone in, say, Texas this morning. Phannie's lounge (fancy term for the main living area) warmed up quickly, and I sat at the computer to see what was going on in the world. Before long, Sandy wandered in and, as we had breakfast, we decided on some warmer clothes, based on what we were seeing on the temperature gauge. The forecast high for today was 71. The drive up highway 145 became ever more scenic with every curve, like in this photo of Priest Lake, which is the headwater for the Dolores River. Bubba and LouAnn give Sandy a hand in jumping aboard the moving gondola. Bless her heart! It was hard to make fun of her, but we were able to rise to the occasion. Notice that we're wearing long sleeves, and I was regretting that I hadn't brought my jacket. Telluride is a marvelously scenic old mining town that has been discovered by the rich and famous, so everything is quaint but modern and, oh yes, expensive. The median price of a house here is $1,100,000.00. Since the gondola ride made us hungry, we stopped at Brown Dog Pizza for some really good pizzas, then the girls went shopping. Bubba and I walked around a bit, but mostly held down some chairs at an outdoor cafe. By this time, I was kicking myself for not bringing a jacket. If it's hard to read in this photo, the sign says, "Please, No Peeing. Thanks." Now the idle mind being the devil's workshop, as it were, I began to wonder how significant this problem must be for the proprietor to have hung out this sign? And for what species is the admonishment intended? Surely not humans; the well-heeled denizens of this mountain resort can't be that liberal! (Maybe they can.) Assuming I'm right about this, then the culprit must be a dog, I guess, even though the sign doesn't say that. Given the placement of the sign near the sidewalk, are we to assume that dogs in Telluride are smart enough actually to read the sign and, thereby inspired, be civic-minded enough to hold their bladders? We may never know. It wasn't long until the shopping trip was over, and we headed back to the tramway. Sandy did much better on this trip up and over the mountain, although we did hear a few yelps as the gondola jerked upon entering the stations. LouAnn and Sandy, whose countenance is much more at ease on departure from Telluride, which you can see behind them. As we leave the tramway station and return to our car, we see this decorated lampost--further evidence that Telluride is a beautiful place and kept that way for the enjoyment of all. Don't miss it, but don't forget your wallet. What a fun day! It's hard to imagine how anyone could get tired of traveling and seeing new and wonderful things as we did today. We have arrived in the Durango area for three days before heading to Priest Gulch Campground near Dolores, Colorado, where we'll meet friends Bubba, LouAnn and daughter BreAnn. I almost don't want to tell you about the Sky Ute RV Park, because finding it was a real coup, and it already stays full most of the time. The RV park is located beside the Sky Ute Hotel and Casino just north of Ignacio, Colorado. It is run by the Ute Indian tribe, on whose reservation it it situated. The Sky Ute Hotel and Casino, viewed from the RV park. You can tell from the photos that it is a classy resort, with asphalt and concrete spaces complete with curbs, grills and picnic tables. The unreal part is that the space rental is only $30--but it gets better: If you have Passport America, it is only $15 a night, no matter how long you stay! Of course, this is an incentive to lure gamblers to the casino, but playing the games is not a requirement for staying here, luckily for us. The fifteen-dollar rate is about one-third the price you'll have to pay in Durango. The only drawback is that it requires a little extra driving to Durango, 16 miles away. But that didn't bother us; accustomed as we were to living in a big city, that is almost next door! One word of warning if you think about coming here: Make your reservation well in advance; Sky Ute has been discovered, I think. We finally found some of the cool air we've been hoping for since we left Texas! The elevation here is 6,500 feet and, during the day, the temperature is about ten degrees cooler than Albuquerque. But during the evening is when it cools off quickly. Our first morning here surprised us with an outside temperature of 53 degrees! I didn't turn on the heat in Phannie, although it would have felt good. I knew it wouldn't be long before the intense sunlight would be heating things up rapidly. We will be joining our friends at Priest Gulch, Bubba's favorite campground in the whole world. 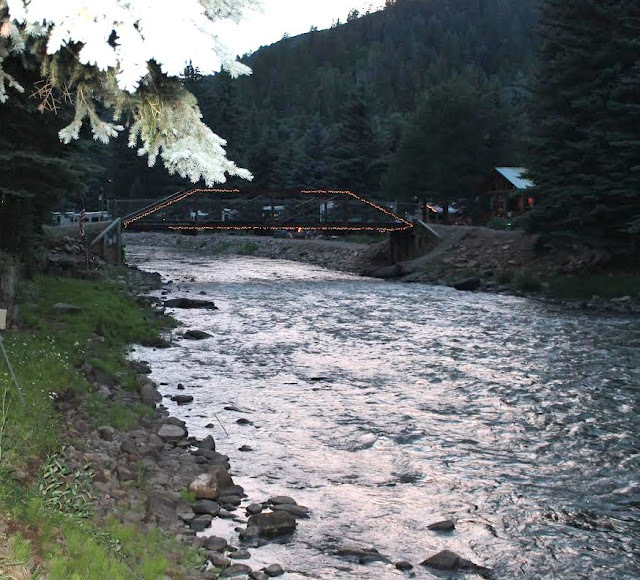 We've never seen it, but we understand that it is a beautiful RV park beside a mountain stream. We're looking forward to sending you photos. 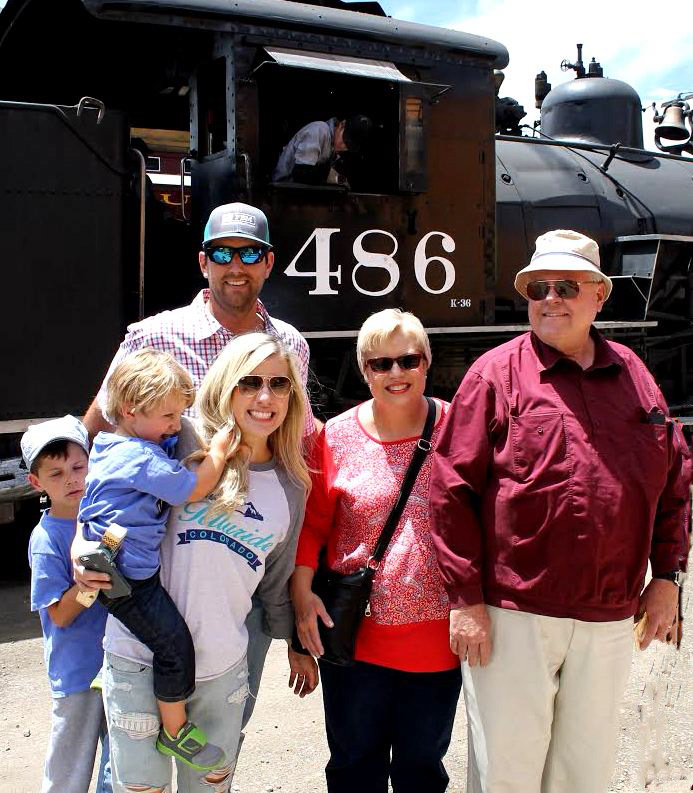 After four nights there, we'll be headed back to Durango, where we'll be meeting Tyler and Mindy and the grandsons, who will fly in and join us for a ride on the train to Silverton next weekend. We happily picked up our little red car from Reliable Chevrolet; she sported a new left front wheel bearing and a new hubcap, as the old one had a crack in it. Getting up to speed afterward, it was clear that the bearing was indeed the problem, as Mae now rolled along smoothly and silently. We're still very happy with how reliable and nearly trouble-free she has been. Besides the 75,000 miles she has been driven, she has been towed by Phannie for at least another 35,000. I'm attributing some of the laudable service to her upkeep, about which I'm pretty fanatical on all of our vehicles. I'm shooting for 150,000 miles as a goal before thinking about a trade. Both Germany and Japan were working on the development of an atomic bomb immediately prior to and during the early years of WWII; the U.S. simply beat them to it. The development of the bomb was called the Manhattan Project because the Northeast Division of the Army Corps of Engineers, charged with the project, was headquartered in Manhattan, New York. The Manhattan Project cost $2 billion ($30 billion in today's dollars). The bomb dropped on Hiroshima (Little Boy) was smaller than the one dropped on Nagasaki (Fat Man), but it did twice as much damage. The difference was due to the rather substantial difference in the design of the two weapons. Unlike Fat Man, Little Boy was untested before it was dropped; they were just hoping for the best. One man apparently survived both blasts. A resident of Nagasaki was visiting in Hiroshima at the time the first bomb exploded, but managed to escape and return to Nagasaki, only to be there when the second bomb exploded. He survived both blasts and lived to an old age. I'm not sure if he was the luckiest or unluckiest man who ever lived. Little Boy weighed 9,800 pounds; Fat Man was 1,000 pounds heavier. The bombs were dropped from 30,000 feet, a height unreachable by Japanese anti-aircraft guns. Both detonated at 1,900 feet above the ground. Besides the B-29, a B-47 and B-52 were available for visitors to view, in addition to an F-4 and F-15, among others. I highly recommend all of the museums we visited here in Albuquerque. I have mentioned only a very few of the exhibits that are definitely worth seeing. 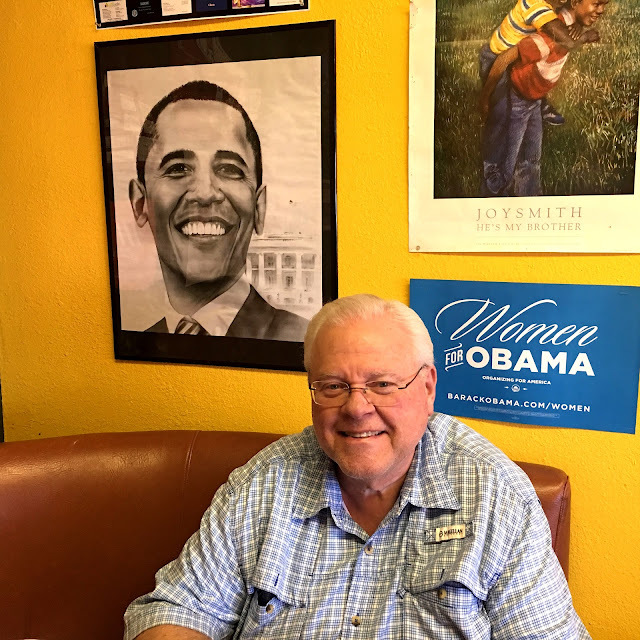 Needing a barbeque fix, we dropped in to Pepper's Bar-B-Q and Soul Food, a hole-in-the wall joint run by a black gentleman who moved here from Denton, Texas. Now some of the best food I've eaten has been in soul food places, so we strode in, undeterred by the um, location, and ordered a brisket sandwich, a rib sandwich and sides of fried okra and corn on the cob. Now I can't include this restaurant in my favorite restaurants list because the brisket and ribs were merely okay--not terrific--as would have been required to be listed. However, the corn on the cob and the okra were fresh, not frozen, something almost unheard of in most BBQ restaurants. They were both delicious. What Pepper's did give me was an opportunity to add not one, not two, but three! items to my list of curiosities and oddities (you know how I like these). The first was obvious at the table--a bottle of Pepper's Slurp and Burp BBQ Sauce. Is that not the best name ever? Actually, the sauce was quite good--something I would buy if I didn't already have some Blues Hog back in Phannie. Now, I swore off ranting and raving about politics in this blog some time ago but, if you knew me, you would know why I call this an oddity. If you find yourself in Albuquerque, you just might want to come to Pepper's for the food besides the BBQ, such as fried chicken or catfish. (Oh, by the way, we also had some killer blackberry cobbler, too.) I just can't put the restaurant on the list for the reason already stated. The other restaurant I'll mention is the Crackin' Crab. Who would have thought that a seafood restaurant totally landlocked in the middle of the desert would have really good, fresh seafood? They must fly it in every day, and that's why the prices are about $25 a head if each orders one pound of seafood, which was quite adequate for us. Frankly, I think it was worth it, considering the product. What you get is a bucket of boiled seafood--you can choose among shrimp, crab, mussels, crawfish, scallops and the like, cooked in a seasoned boil such as cajun (spicy) or lemon pepper. We chose shrimp and king crab in the cajun seasoning, and the boil includes a potato, corn-on-the-cob and sausage. The shrimp were large and delicious in the seasoning, but the king crab, although very fresh, seemed overwhelmed by the spiciness. I think it would have been better to have ordered it unseasoned with a side of melted butter. If you didn't have your quota of playing with food when you were a kid, this is the place for you. The table is covered with butcher paper, and you are issued a plastic bib when you sit down. When the bucket comes, you pour everything out on the butcher paper and get with it, using the shell-cracking tools they also give you. I think we used several dozen paper towels to keep ourselves recognizable. Yes, this will go on the list; it was as much fun as it was good. Now that we are leaving ABQ, I will announce the winner among the restaurants we have reviewed here, and that is (drum roll) the Frontier, downtown on route 66. For flavor, variety, value, history and uniqueness of the experience, it can't be topped. I almost wish we weren't leaving so we could go back once more. The Wigwam Motel - Actually on route 66 in California; most of the old teepee motels along route 66 have been torn down. I had been noticing that our toad, Mae, has developed a slight noise in the front end that sounds a little like a mudgrip tire on asphalt. That certainly isn't normal, so we made arrangements at Reliable Chevrolet here in Albuquerque to get it checked out the next day after we leave it with them later. They will give us a loaner car to drive, a nice touch, for sure! After that, we decided it was time for lunch, so we drove to La Salita, a restaurant in east Albuquerque recommended by cherished readers (and fellow foodies) Bob and Jo, whose blog, "How to Love Where You Are and Eat Where the Locals Eat" has been a favorite read for a very long time. Like us, they publish a list of favorite restaurants on their blog. (That may be where I got the idea; I can't remember.) They had specifically recommended the chile rellenos, and that's what we ordered, along with one of La Salita's combo plates. We noticed on their menu that they had won a citywide award for the best chile rellenos, so we were expecting a treat; we were not disappointed. The large chile was of the Hatch variety, and we ordered it stuffed with avocado. It was perfectly fried in a light batter, with all the flavor of the chile and the richness of the avocado inside. It was swimming in some killer green chile sauce that I would have licked off the platter if there weren't other diners all around. The chile pepper of the relleno and the sauce would have wide appeal because it wasn't too spicy. Personally, I like spicy chiles, but Sandy--not so much. It was a perfect compromise. We enjoyed all the rest of the dishes, too, and we agree that the relleno probably has no equal. This place will go on our list, too. Thanks, Bob and Jo, for the tip! Afterward, after driving around doing some sightseeing, we returned to Phannie in our loaner car and took a nap. At dinnertime, we still weren't all that hungry after our sumptuous repast at La Salita, so we fixed one of our signature Thai salads with Korean chicken in it for a light meal. I was still thinking about the show we saw in the planetarium a couple of days ago, where we learned that we had forgotten some of our meager knowledge of astronomy. When it was nearly dark, I suggested we go stargazing and see if we could identify some of the planets, stars and constellations we had seen in the show. Sandy eagerly agreed, so we hopped in the car and turned westbound out of the RV park onto route 66. In about five miles, we found a little-traveled side road, upon which we turned and drove a short distance before parking and turning off the lights. Once it was fully dark, we could make out the Big Dipper and Little Dipper, even though there was a half moon out and we weren't far enough from the city to achieve the ideal blackness we would have liked. We also learned from the planetarium show that we would have the good fortune of being able to see four planets this evening: Venus, Saturn, Jupiter and Mars. We could make out Jupiter and Mars, but Venus had already set by the time we were parked. We weren't sure about Saturn, as it wasn't immediately distinguishable. Then I remembered that there were apps for the iPhone that would give you a map of the night sky, so I quickly downloaded SkyGuide. What came up on the screen was certainly worth more than the $2.99 I paid for the app. 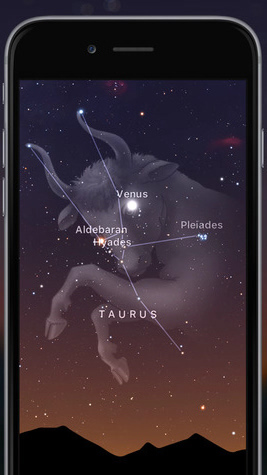 The app knows where you are and, as you move your phone around the sky, the names of the major stars and planets appear on the screen along with a depiction of the constellations and an artist's rendering of them. Not only that, but the app plays soft ethereal music as you enjoy the quiet starry darkness around you. Coolest thing I've seen in a long time! The clear night skies are a very appealing part of the great southwest for us. Sandy and I still recall a moonless winter night years ago when we were driving along a country road near Flagstaff. I happened to notice that the stars seemed brighter than usual, so we stopped and turned off the lights and lay back on the hood of the car. The black sky was ablaze with a million points of light, and the Milky Way was easily visible. It was like nothing we had ever seen, and we stayed there in utter amazement until the cold drove us back into the car. We're hoping to see something like that again now that we have this cool new app on the phone. After this, it was lunchtime, so we stopped at California Pastrami to split a hot pastrami on rye sandwich with a side of slaw. Now this wasn't as tasty as what you get at the Stage Door or Katz's in New York (as if there could be any better), but it was really good. Good enough, in fact, to go on our list of favorite restaurants on this blog. Having gone for a few hours without shopping, Sandy felt obligated to correct that omission and save her reputation. So, I dropped her at the Coronado Mall, where she picked up something for the grandsons, who will be joining us in about a week in Durango. 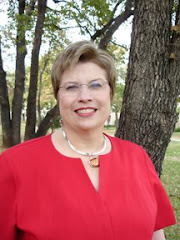 She returned to the car rejuvenated, chatting merrily about what she had found for "the boys." She is truly the ultimate Mimi, complete with a license to spoil. Me? I don't remember saying no to, well, anything. I see my role as making sure the funds are readily available. I guess that makes me just as complicit, doesn't it? After that, we made a stop in Old Town and took in a couple of the exquisite museums found there. At the Museum of Natural History, we decided to see a show in the planetarium. This was excellent, and we were a little surprised at what we had forgotten about what we see in the heavens. We then went over to the Albuquerque Museum of Art and History to take in the Route 66 exhibit. This was a very enjoyable and nostalgic visit to a simpler time when Americans were beginning to enjoy traveling their country in the postwar years. I love this historical period, and I applaud those who are attempting to save the iconic buildings along Route 66 as it traverses Albuquerque and much of the width of New Mexico. Do you remember these old signs at Chevrolet dealerships? After enjoying the Route 66 exhibit, we strolled through the art museum, which had some very nice paintings. I'm not quite sophisticated enough, I suppose, to enjoy modern art all that much, so we didn't spend much time in that section. We saw later a couple of oil paintings with a western theme that we thought were spectacular. The first one below was painted by Ernest Blumenschein in 1920. "White Sun and Star Road" was his impression of the angst among native Americans as a result of forced assimilation and the resultant loss of culture, as well as the generational reorientation of attitude between the elder man in the background (sadness) and the younger one in the foreground (definance); this is so well borne out in their expressions. The photo doesn't begin to do justice to the artist's magnificent work, including his amazing capture of the light from the noon sun that is overhead the two men. I would return to the museum again, I think, just to take another look at these paintings. The next painting we liked was by Santa Fe artist Tom Palmore. He painted "Survivor" in 1995. It is a perfect rendering of a coyote and one of the most popular paintings in the museum. Again, the photo is wholly inadequate to portray the breathtaking likeness to the real animal. After our afternoon at the museums, we stopped at Pad Thai, a tiny, family-run Thai restaurant where they know what they're doing with Thai food. Since the restaurant was named for the iconic Thai dish, that's what we had, along with a beef salad and chicken satay. It was among some of the best Thai food we've had and it, too, will go on our best restaurants page on this blog. What a fun day in Albuquerque! We're glad we're staying a couple of extra days because Mae has developed a little mechanical problem, and we have to get that checked out. (Yes, we are still enjoying the novelty of being able to linger in a place as long as we need to or want to. That's among the many benefits of being retarded retired.) We'll give you an update on Mae in the next post.